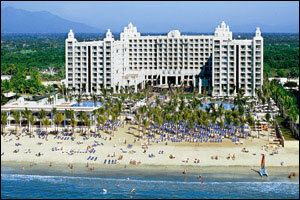 THE RIVIERA NAYARIT (RN)area is a resort paradise north of Puerto Vallarta along Banderas Bay. Located in the state of Nayarit, the Riviera stretches along 100 miles of beautiful coastline framed by spectacular mountains. Riviera Nayarit features luxury resorts, eco-tourism excursions, world class golf, wildlife sanctuaries, charming fishing villages, miles of serene beaches, water sports, the exclusive Punta Mita area and the colonial town of San Blas at its northern tip. The focus is luxury in harmony with nature all wrapped up in an authentic Mexican ambience. While vacationing in Riviera Nayarit, you can experience a step back into time in traditional Mexican towns, quaint fishing villages, natural pools, surfing, golf, canopy zip-lining, whale watching, fishing, sea lion encounters, turtle releases and more. 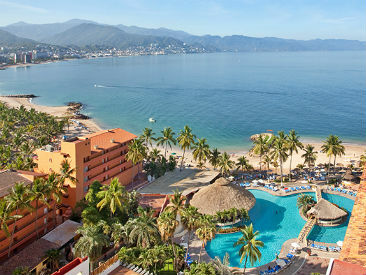 PUERTO VALLARTA (PV), on Mexico's glamorous Pacific Riviera, is ideally situated between the majestic Sierra Madre Mountains and the vast Pacific Ocean. This popular seaside resort town, made famous by John Huston's film, Night of the Iguana, has been welcoming sun-seeking visitors for decades. Stroll along the cobblestone streets of the old town where you'll discover white-washed and red-tile roofed houses dripping with colorful bougainvillea along with an amazing array of enticing shops, cozy cafes and lively night spots. You'll find several different resort areas, each offering a little something different from the next, including Old Town Vallarta, Marina Vallarta, the Boardwalk and the hotel zones both north and south of downtown. The destination is a perfect combination of sophisticated resort hotels (most situated along beautiful Banderas Bay), and captivating old-world Mexican charm. Explore the palm-covered hills by mountain bike or desert jeep, enjoy championship golf courses within easy reach of most hotels or discover the wonders of the deep on a sailing excursion or a scuba-diving trip. A perfect blending of Mexico's natural beauty with a vibrant and colorful culture, Puerto Vallarta and Riviera Nayarit vacation packages offer something for young and old alike. 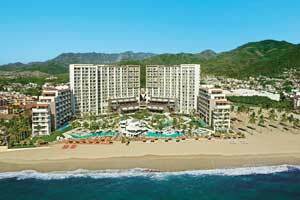 Relax at the AAA Four-Diamond, all-inclusive Hilton Puerto Vallarta Resort. Just five minutes from the airport, ten minutes from the Colonial charm of the city center, and in walking distance of the cruise port. 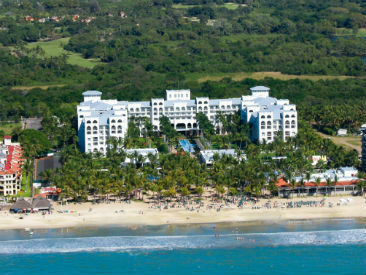 Admire panoramic views of Banderas Bay and the Sierra Madres. The resort’s 259 rooms and suites, designed with modern decor and private balconies, feature spacious bathrooms, and signature Serenity beds. A superb all-inclusive choice for families! A complete daily activities program for adults and children includes kids clubs and mini water park, heated pools, tennis courts, game room and outdoor games area. 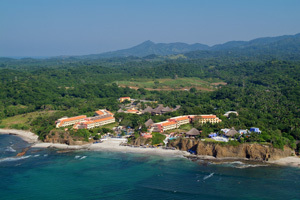 Located in the beautiful Riviera Nayarit area and perched on a bluff overlooking a beach cove, this secluded resort offers couples and families a thoroughly relaxing vacation experience with several dining options, water sports, fabulous kids clubs and recently expanded spa. 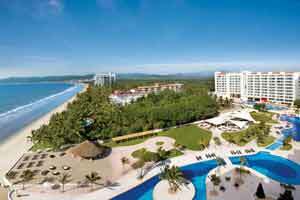 The all-inclusive beachfront Riu Jalisco, in Riviera Nayarit, features two large swimming pools with outdoor Jacuzzis, a spa and a wide array of resort activities and dining options for couples and families with children. 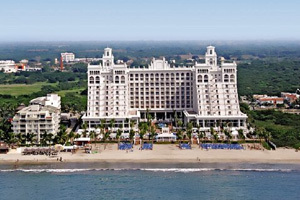 The art-deco style all-inclusive Riu Vallarta is located next to the Riu Jalisco in Riviera Nayarit with two pools, endless activities, spa, gourmet restaurants and personalized service for all age groups. 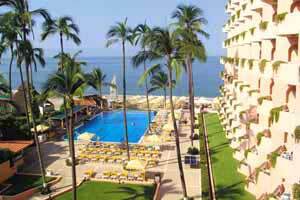 The all-inclusive Crown Paradise Golden Puerto Vallarta was designed for adult guests 18 and over with service, comfort, romance and relaxation provided with gracious Mexican hospitality. 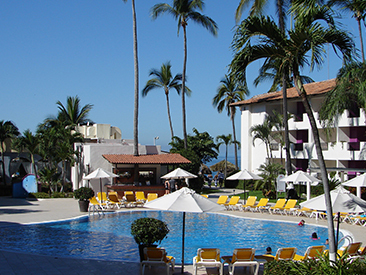 Sunscape Puerto Vallarta Resort & Spa located in Mexico’s beautiful Puerto Vallarta is the perfect destination for families, couples – anyone looking for fun! With an exhaustive list of activities, games and classes, there's no way your vacation here will be anything short of electrifying! 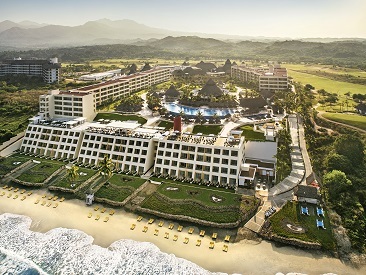 Located in Riviera Nayarit on Banderas Bay with lavish suite accommodations in two 10-story towers, gourmet dining, 24 hour room service, an endless array of leisure and recreational opportunities, supervised Explorer's Club for kids and Unlimited-Luxury®. Magnificent architecture and elegant furnishings combined with unparalleled service and abundant facilities offer guests of all ages an ideal vacation spot for recreation, romance and relaxation. 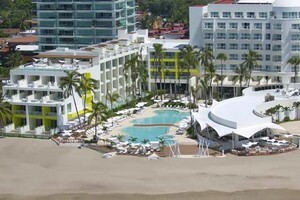 Located on the beautiful and secluded tropical beach Las Estacas in Puerto Vallarta, Mexico, is the newly-renovated, all-inclusive Hyatt Ziva Puerto Vallarta. Perfect for guests seeking any type of escape, this Hyatt Ziva location is the destination to fulfill every dream. With a great location, just five minutes from downtown Puerto Vallarta, guests of all ages enjoy Unlimited-Luxury® and a vibrant ambiance including luxuriously appointed ocean view rooms and swim-out suites, 24-hour room service, great kids clubs and activities galore! 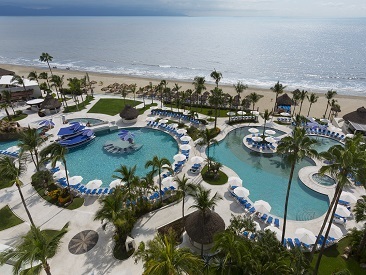 Elegantly appointed adults only Unlimited-Luxury® resort located near Vallarta's famous boardwalk offers guests 18+ a unique blend of daytime activities and nightly entertainment with five gourmet restaurants, 24 hr. room service and spacious ocean view suites. 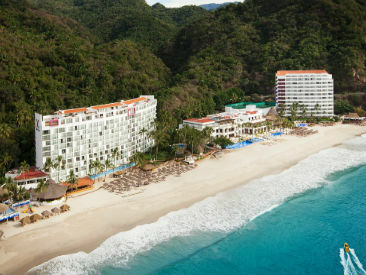 The AAA Four Diamond Award winning, all-inclusive Hard Rock Hotel Vallarta is situated on the golden sand beaches of beautiful Banderas Bay in the exciting Riviera Nayarit area, just minutes from shopping and golf. A perfect laid-back vacation choice for all ages. Enjoy valuable extras with $1,800 Resort Credit promotion!